Don’t get me wrong, I love making Christmas cookies. I like making different kinds so there’s an assortment. I always think it’s fun for a group of people to try a selection of foods and talk about their favorite items and what they like about each one. I just went to Sidecar Doughnuts in LA with my friend and husband and had a great time ranking all of our favorites together. I could talk about food that I’m passionate about in great length! Anyways, I’ve found that I’ve also enjoyed the aesthetic of a pretty Christmas cake so I made sure to find a time to bake one around the holidays the past couple of years. 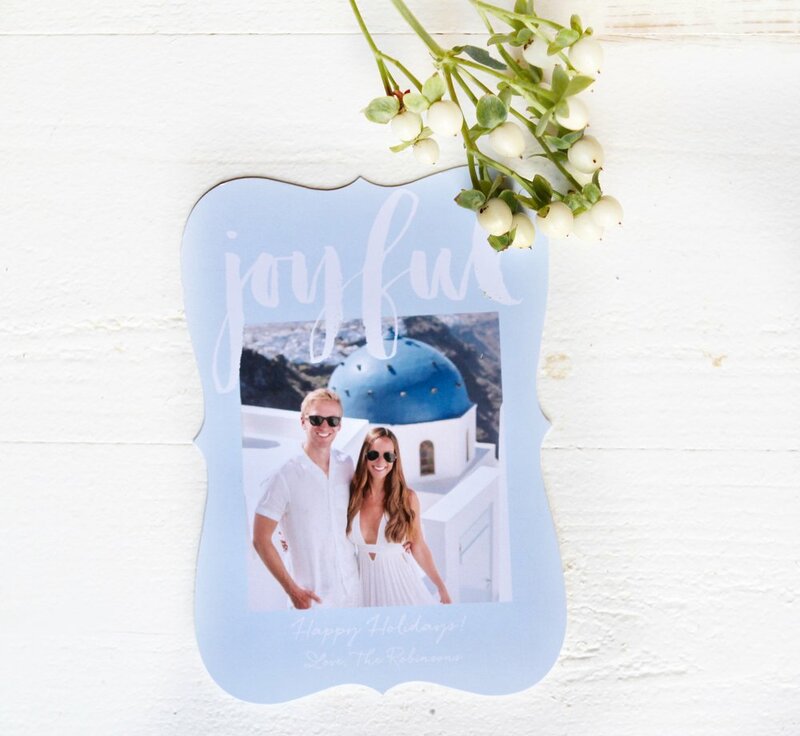 I love the festive but simple decorating ideas that you can do to them. I feel like it provoked a fun reaction from your hosts when you bring it to a gathering or from your guests if you’re hosting a party. People ooh and ah over the simplest things, like this cute gingerbread topper that I bought. 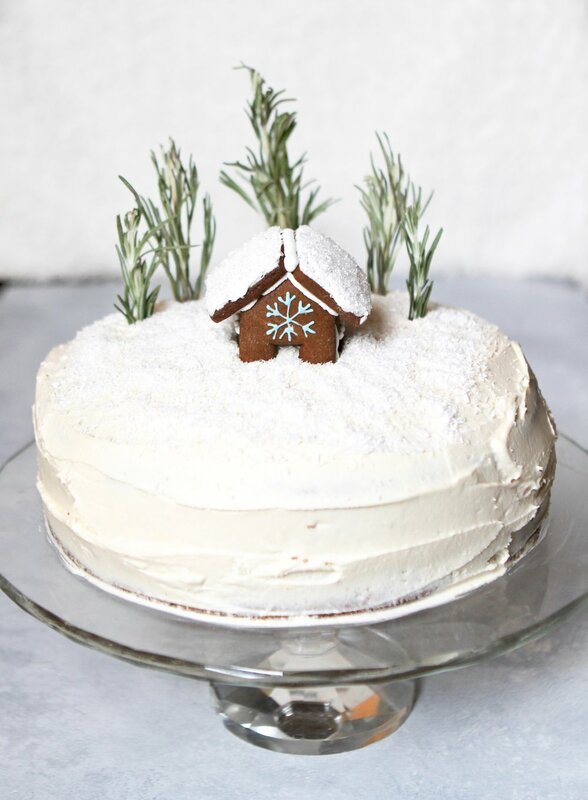 Since I created more a Christmas spice cake recipe last year, I wanted to do something a little different. I’ve made a bunch of cakes from scratch and some are worth it and some are really not because box cake mix for a funfetti cake, for example, is usually better and 1/102840th the work. However, this banana cake would be hard to find in a ‘cheat’ alternative so I think that it makes it worth the ‘from scratch’ elements. Plus, it was delicious! Coat 2 9-inch round cake pans (or 3 8-inch round cake pans) with nonstick coconut oil spray (or whatever nonstick spray you typically use). I used a foam-spring cake pan so that the cake would easily come out of the pan. Set aside. If your bananas are not ripe enough, you can puncture some holes in the peel with a fork and then wrap them in a paper towel and microwave them for 30 seconds. Mash the bananas with a fork on a cutting board until they are totally soft and slimy looking. In a medium bowl, combine the milk and lemon juice and set it aside. In your electric mixer with a large bowl and fitted paddle attachment (linked below), beat the butter and both types of sugar on medium speed. Beat for 2 minutes. Add in the vanilla, salt, eggs, and baking soda. Mix on medium speed until smooth. Alternate adding in the flour and milk on low speed a 1/2 cup at a time (make sure to start and end with flour). Add in the bananas and mix on low speed. Split the batter evenly between the cake pans. Bake for 35 minutes or until it passes the toothpick test (you stick the cake with a toothpick and it comes out clean). Rotate the cakes in the oven halfway through baking them. Let the cakes cool in the pan for 15 minutes and then place them on a cooling rack to cool completely. In a bowl with a mixer and paddle attachment, beat the butter and salt on medium speed for 2 minutes. Lower the speed to low & add in the powdered sugar 1/2 cup at a time. Best until all powdered sugar is incorporated. Raise the speed to medium and add in the milk and vanilla extract. Beat for another 2 minutes. Make sure that the cakes are completely cool before frosting them. Add a frosting layer between the 2 (or 3) cakes. This time of year makes me want to have all the hot drinks! It’s alsp probably the biggest drinking season of all. I thought I would combine the two and make a hot cocktail. I made this for some of my friends when they came over and everyone liked it. Sometimes, I have to live up to the Cozy Curator reputation and this cocktail helped since it’s plenty cozy! Plus, it’s so easy! This cocktail is perfect for Christmas celebrations. Over a stovetop, combine all of the ingredients except the whipped cream. Heat over low heat until it is hot while continuously stirring. Pour into mugs & drain out the cinnamon sticks. Every holiday season I’m looking for fun cocktail ideas that aren’t loaded with a ton of sugar (for taste purposes, not splurging purposes because the holiday’s mean you can load up on sugar). Jay loves tequila so I wanted to incorporate that into a recipe, especially since its so rare for Christmas cocktails. These are so festive and taste really fresh! Mix all of the ingredients in a large shaker. Shake/mix thoroughly right before pouring. The other night on Instagram stories I was talking about this healthy meal that’s a go-to of mine when I’m craving something hearty and cozy without the pasta. This meal just screams ‘home cooked’ in that way that makes you want to dim the lights and get in your coziest clothes while stuffing your face. However, this option comes without the major guilt. Plus, its surprisingly good (obviously, not as good) when you have it for leftovers the next day. I’m all about doing work that I can get 2 meals out of. In order to get 2 full meals for 2 people out of it, double the recipe! In the morning, slice your zucchini lengthwise into thin strips (about 1/8 inch thick). Lay the slices flat onto paper towels and then sprinkle them with salt. Lay another paper towel on top of the zucchini. Let is sit for a few hours (or until you make the meal that night) to lose as much water as possible. Once you are ready to prep the filling, spray a large skillet with olive oil spray and place over medium heat. Sauté the spinach in the pan until it reduces. Set it aside so it can cool down. In a medium mixing bowl, combine the ricotta, parmesan, 1/2 of the mozzarella cheese (so 1 cup), spinach, garlic, egg, black pepper, and basil. Stir to combine. Spread 1 cup of marinara sauce onto the bottom of your baking dish. Set aside. Spread approximately 1 T of the ricotta mixture onto each zucchini slice and then roll it up and place it inside of the prepared baking dish. Repeat until the dish is filled with the zucchini roll ups. Then, top with the remaining marinara sauce and remaining mozzarella cheese. Cook in the oven for approximately 30 minutes or until the lasagna rolls are heated throughout and the cheese is golden brown. Podcast: I've been loving Armchair Expert podcast by Dax Shepard. I've always been a fan of his but now am even more so. I love people and getting to know them and their stories. Howard Stern interviews have always been favorites of mine because they really don't have a large agenda and are more so about getting to know someone and their story. Human nature, how we all cope, love, and things like that are my JAM and Dax is in touch with a lot of that and really highlights it in his podcast. I listen to it on the Podcasts application that came on my Iphone (make sure to download episodes while you have WIFI). I will listen to an episode over the course of a couple of days, broken up into little segments. I listen as I'm folding laundry, applying lotion after I shower, cooking dinner, running errands, driving, etc. 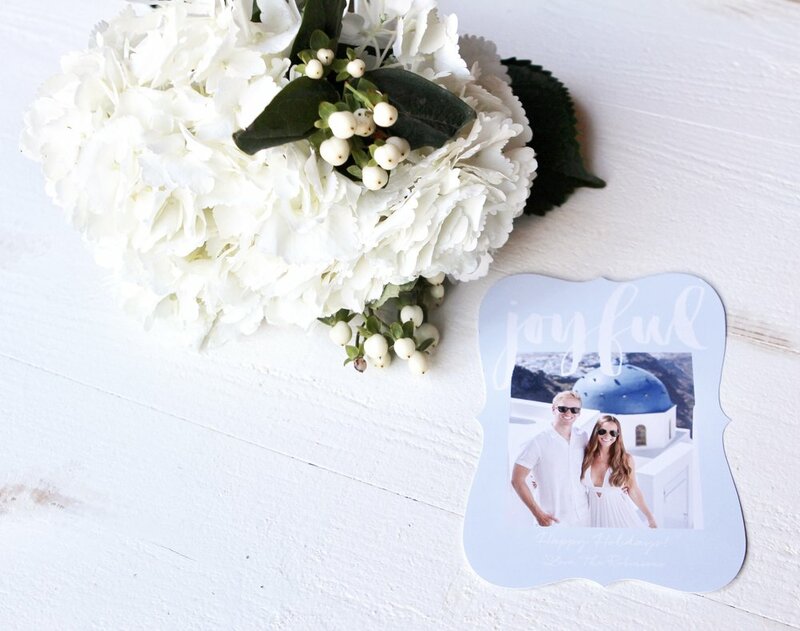 It's such a great way to stay entertained and engaged during all of the mundane tasks. Plus, for someone who works from home, it helps me feel less isolated during the day (sad but true). My favorite episodes were: Mila Kunis, Mae Whitman, Anna Faris and Jimmy Kimmel. If you're a Parenthood fan (like me), then you will appreciate all of his cast mates interviews! He also does one with his wife, Kristin Bell, which was cool. I've honestly loved all of the ones that I've listened to but that's my highlight reel. Music: My album of the summer has been Come Tomorrow by Dave Matthews Band. I was raised on DMB and have been a fan since I learned how to talk/sing. My mom is a huge Dave Matthews fan and always incorporated his music into our lives. She was so passionate and would rewind songs and say "did you hear how much he loves her by the tone of his voice?" "did you hear that line, let me play it for you again." Now, I annoy Jay by doing the same things. I have had tears in my eyes more times than I can count from his songs. So many summers of my life are marked by his albums. The songs from them can transport me back in time in an instant. It's so cool how music can mark the timeline of your life like that. I remember the couple of songs that I was obsessed with the summer before my senior year of high school for example and it always puts me back to that moment when I listen to them. I attended his concert every year from the time that I was 11 or so and those also marked the summers in my mind. I've only gone to 1 since my accident and it was so hard on my back that I haven't gone back since but its something that I truly miss SO much. I want to try and find a way to make it work somehow in the future because it feeds my soul. If you haven't listened to this new album, you definitely should! I love the first song to his daughter(s). I also love Can't Stop, That Girl is You, Here on Out, Virginia in the Rain, and When I'm Weary. I really wanted to name them all but controlled myself haha. I read the Cold Fury Hockey Series this summer and really liked it. Each book is about a different player on the Cold Fury professional hockey team. I downloaded all of the books as a package on my kindle. They are quick and easy reads that keep you engaged the whole time. I love reading a series because I feel like otherwise you fall in love with characters and then they are just gone from your life. With this series, I was able to keep those characters around because the next book would be about their friends or siblings and the characters from the previous books would make appearances and you'd get updates on what's going on with them. I read for relaxation and to escape so I typically don't read thought provoking books (I'm more likely to listen to those on an Audible or listen to podcasts). Instead, I want to read to escape and turn my mind off (and prepare to sleep). I personally love romance novels but I know they aren't for everyone (especially if you're prude haha). If you're on board with love stories, in this case about professional hockey players, then definitely check it out! I feel like we always watch less TV in the summer. We're not really binging a show or setting aside the time to do so. We probably have been watching 1 episode of GOT a week (still catching up) and 1 other episode a week. We've been liking watching My Next Guest Needs No Introduction by David Letterman on Netflix. They are stand alone episodes so it's perfect to watch one here and there when you aren't sitting down in front of the TV frequently. Like the Armchair Expert podcast, he doesn't have much of an agenda of what he has to talk about as the guests aren't really coming on the show with the intention to promote something. I don't think that Letterman is as interesting of an interviewee as Dax because he doesn't divulge much about himself and his own feelings on topics and really just redirects every question that he's asked. Still, he's a legend and is funny. His guests are awesome. My favorite episodes were Jay Z and Obama's. If you like interviews that "go there" then definitely check this out. I'm always looking for healthy dinner recipes to mix it up. I also like recipes that I can easily use the leftovers for lunches. All about killing 2 birds with one stone! In fact, I killed 3 birds because I also used some of the roasted veggies in a Mexican salad the following night. Technically, I killed zero birds because this meal is vegan! 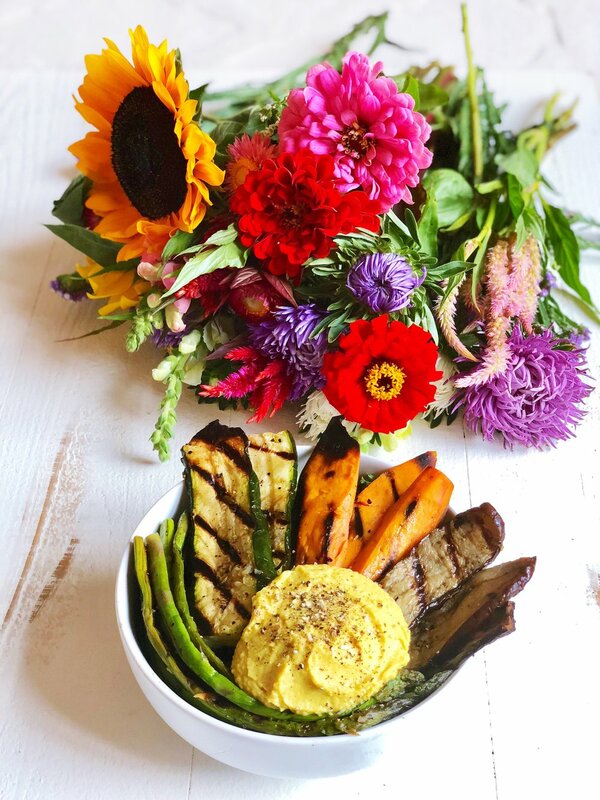 The turmeric hummus is an awesome way to add some turmeric into my dinner in a way that makes sense. I started taking a turmeric supplement daily because its supposed to help with inflammation (I also take flaxseed oil supplement for this reason and try to eat a lot of flaxseed as well). However, I try to work it into my diet as well. I even doubled the hummus recipe and froze half of it, which I don't think was necessary in hind sight because it was so easy to make. I had turmeric hummus at a farm in Ibiza this summer and its amazing how quickly tastes can transport you back to a moment in time so that was a nice plus as well! Combine all of the ingredients in a blender until smooth. Blend for longer if you want it thinner and more whipped. Top the salad base with all of the roasted vegetables and the hummus and enjoy! Grilling season has begun! Yay! I love grilling up on our rooftop or on our patio. It's great to be able to incorporate some of my summer 'go-to's into my meal planning because I feel like I exhausted all of my winter regulars. I love some fresh corn on the cob when its grilled...doesn't it taste like summer?! 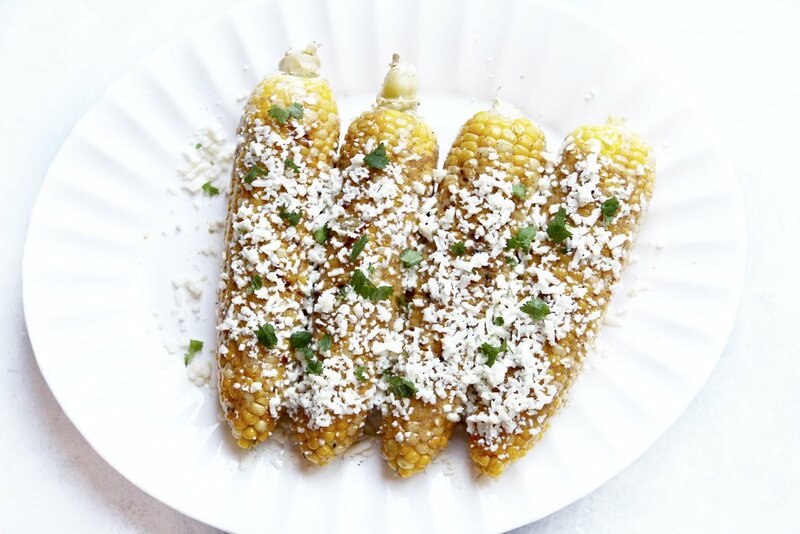 This Mexican Street Corn recipe elevates corn on the cob in the best way. I usually use some guacamole on our burgers/veggie burgers to tie in the Mexican theme in an easy way. Whenever I see cojita cheese at the grocery store in the summer, I buy it so that I can make this awesome recipe! You guys know that one pan meals make my heart happy. My biggest deterrent for cooking is the clean up...anyone else?! That’s why I’ve LOVED my cast iron skillet and legit crockpot (linked at bottom of post). They can both go from stovetop to inside of the oven and the crockpot insert can obviously also go into the crockpot base for slow cooking. 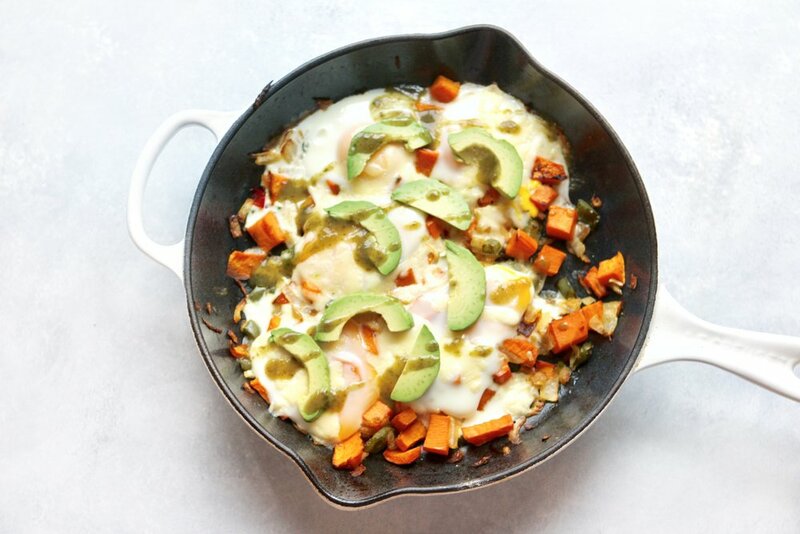 I’ve been making variations of this sweet potato skillet for breakfast for my guy (I don’t eat straight up eggs) and he LOVES it. It’s all real food and so nutritious. I've also added black beans and ground sausage at various times when I've made variations of this. I also recently swapped the avocado for guacamole and the hot sauce for salsa and it went over really well! Try it out and let me know how you like it! Peel the sweet potatoes and then dice them into 1 inch cubes. Dice the onion and bell pepper. Slice the avocado into thin slices. Dice the green onion into 1/2 inch circles. Heat the cast iron skillet over medium heat and place the olive oil, onion, sweet potato and bell pepper in it. Cool until the onions turn translucent. 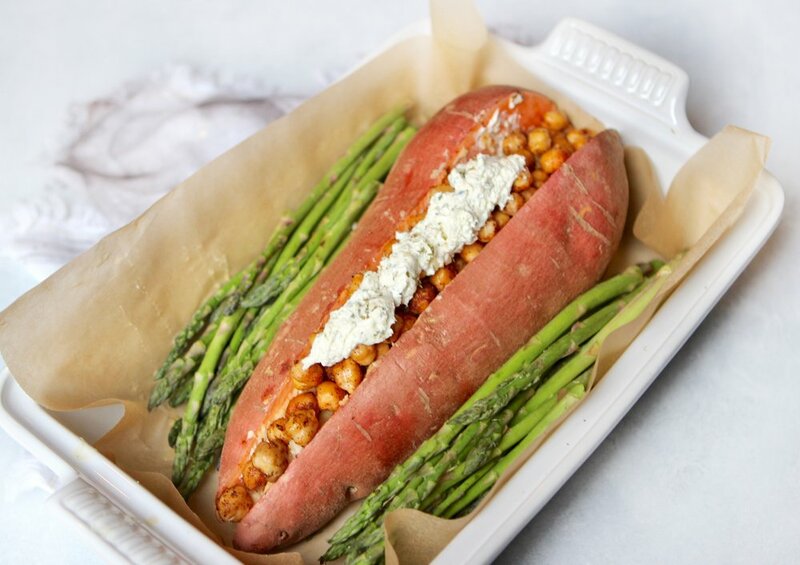 Place the cast iron skillet into the oven for 25 minutes (you want the sweet potatoes to get soft enough to eat). Remove the skillet from the oven and crack the eggs on top of the vegetables. Then, sprinkle with the shredded cheese. Place back in the oven for 5 minutes or until the eggs are no longer runny. Remove skillet from the oven and top with avocado slices, green onion and hot sauce. Enjoy!